At the time I was taking workshops at the San Francisco Baking Institute, almost 10 years ago now, the founder and director of the institute, Michel Suas, gave an interview for some periodical. He was asked what he thought the next trend in bread baking would be. As I recall, his confident answer was “ancient grains.” Back then, the SFBI was using whole wheat in a few breads and high-extraction flours in miches, at least. I don’t recall any West Coast bakers selling breads with spelt, Kamut, emmer or einkorn at that time. I first heard of spelt from janedo onThe Fresh Loaf. Of course, I subsequently learned that spelt (“épeutre” in French, “dinkel” in German), at least, was in fairly common use in France and Germany. Time has proven Michel Suas correct. Chad Robertson’s second bread baking book describes his quest to learn more about using whole grains and ancient grains to make bread that exploits their unique flavors and nutritional advantages. The breads in “Tartine No. 3” are made using the same basic techniques as described in “Tartine No. 2.” Most are made with high-extraction and whole grain flours and with blends of three or more flours. There are a couple changes in technique, or at least emphasis from Tartine No. 2 to Tartine No. 3. First, Robertson has become a fan of prolonged autolyse. He specifies a minimum of 30 minutes but clearly prefers a longer time - overnight for many breads. This is even more interesting when you realize he includes the levain in his "autolyse" mix. Second, he has increased the preferred bulk fermentation temperature from 78-82 dF to 80-85 dF. I have blogged about my first bake from this book - the 60% Kamut bread. This blog entry is about my second bake: The first recipe in the book, which Robertson calls “White-Wheat Blend (Ode to Bourdon).” Bourdon being Richard Bourdon, the Berkshire mountains baker with whole Robertson apprenticed after graduating from culinary school and before moving to California. This bread is made with a blend of 50% high-extraction wheat flour, 25% whole-grain wheat flour and 25% White whole wheat flour. The flours I used were Central Milling Organic Malted T70 flour, home-milled Red Turkey Wheat flour and King Arthur Flour White Whole Wheat flour. It also includes 7% wheat germ. The dough is 86% hydration (calculated by including the flour and the water in the levain). For this bake, I bulk fermented the dough at 85 dF in my Brød & Taylor proofing box. It developed quickly and well. Bulk fermentation was about 3 1/2 hours. It was cold retarded for about 10 hours and baked in a Lodge Combo Cooker. Because of the high percentage of whole grain flour, the dough is just a bit sticky - rather well-behaved, if the gluten is well-developed. With gentle handling, the resulting crumb is quite open for a bread with so much whole wheat. The flavor is delightful - wheaty, nutty, mildly sour and not at all grassy. Happy New Year and Happy baking! Yeah, that is very nice crumb for a 100% whole wheat loaf. And a Happy, healthy and productive New Year to you and your family! I wish I could source all these special flours. Did you notice any difference in flavor with autolyse with just flour and water and one with the levain included? Thanks, everyone, for your nice comments! And a very happy New Year to all of the TFL family! Regarding autolyse with levain: I really can't tell you the difference between breads made with or without the levain in the autolyse. The reason is I always make each bread the same way (with or without, etc.). I base my choice generally on what I was taught at the SFBI. If the formula calls for a liquid levain, you include it in the autolyse. If it uses a firm levain, you add it with the salt after the autolyse. The explanation was that a liquid levain contains a significant amount of the total water in the dough, and the fresh flour should be exposed to it. Now, this theory doesn't account for procedures like Robertson's, where he has you hold back some of the water to be added with the salt after the autolyse. I understand the theory behind "double hydration" when making ciabatta and other very high-hydration breads. I don't really understand it as used by Robertson. Maybe it's to keep the salt from stealing water from the flour. Anyone know? and with the firm levain. That makes perfect sense! By the way, that loaf just about killed me when I tried making it. I just couldn't seem to get the same crumb that was displayed in the book. I finally gave up and found that by reducing the hydration, my loaves turned out better, not perfect, but better. You seemed to hit it right on! Well done! The point is that flours differ a lot in how they behave. When you have a formula that calls for 3 flours, there is more opportunity for your dough to differ a lot from Robertson's. He uses fresh-milled flours. He talks about "high-extraction flour" being fresh-milled then sifted. But that could result in anything between 75 and 95% extraction, depending on how finely you mill the grain and what you use to extract some of the bran and germ. I used a pretty low-extraction high-extraction flour - supposedly a clone of French T65. Some years ago, I arrived at a personal ideal range for dough consistency. I use published formulas as a starting point but adjust hydration to achieve a dough in the desired range. Well, there are exceptions for when I am really aiming to reproduce a bread that has a much higher or lower hydration. But, you get the idea. 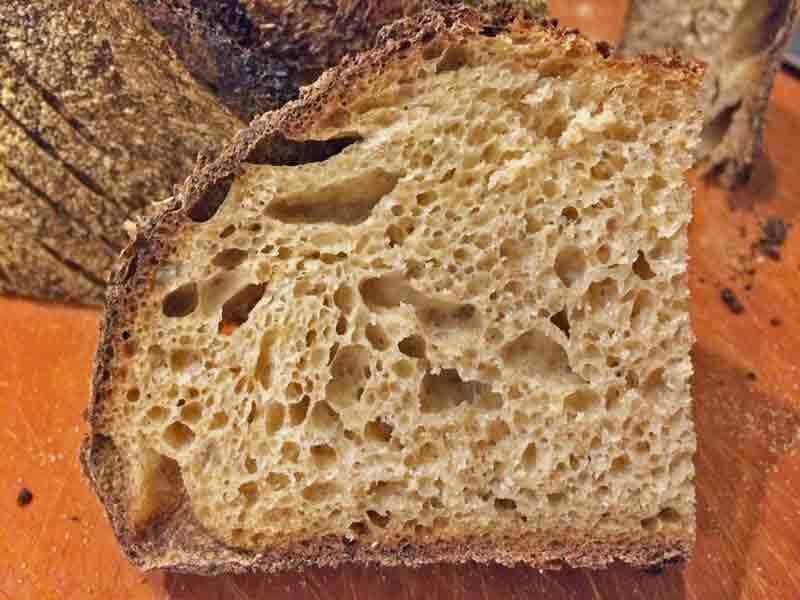 To complicate things further, the notion that how open the crumb is only depends on hydration is clearly wrong. But that's another story for another time. Another bread book cover bread! Happy New Year, David! This is the perfect bread for a new year! It looks great inside and out! It has to to taste wonderful too! Well done indeed! Happy baking in the new year Daivd! Very impressive indeed! I wished I could report the same success for my first bake of 2018. I tried Country Sourdough with Less Levain & Longer Autolyse from Maurizio's website. https://www.theperfectloaf.com/country-sourdough-less-levain-longer-autolyse/. Although he explicitly points out that this is high hydration dough I had great trouble this morning. I had kept the dough in an oblong banneton that was even covered with a linen cloth. But when I tried to invert the loaf straight from the fridge into my cloche it stuck to the cloth and almost dripped into the cloche. The result is not the most appealing but the bread does have a very nice crunchy crust and a subtle pleasant taste. With a mix of AP and Rice Flour?